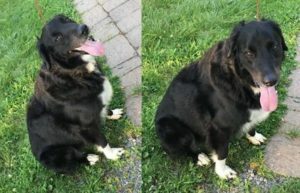 Additional Notes: MALE: Border Collie mix (? ), adult, black and white coat with white blaze on neck and chest, white socks on paws, wearing a multi-coloured nylon collar with a tag for Sanibel, Florida. Found roaming on July 4/18.